A couple of years ago I had great fun working on what was essentially a conversion project. You know the kind: “Take this PowerPoint, narrate it, make it interactive and produce a SCORM-compliant module.” This kind of project can be mind-numbingly boring. But this content was really fun. An environmental consultant needed to train field personnel to “sweep” field and forested sites for birds and nests so that construction and clearing work wouldn’t disturb their nests or habitat, particularly during the breeding season. One slide in the PowerPoint included a site sketch and some notes — which I had to narrate. 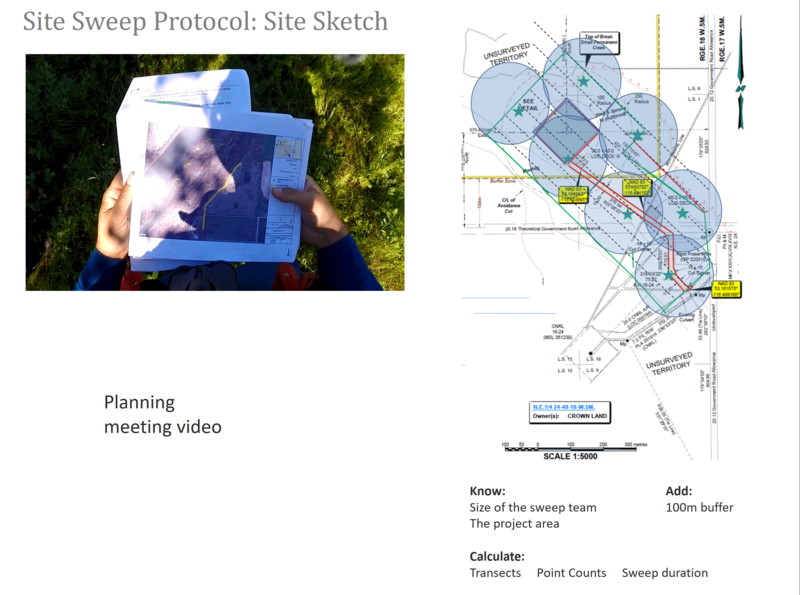 The sketch itself is very important since field workers have to read such sketches to learn where and how to perform their bird-sweep activities. But the notes didn’t make much sense looking at the sketch. The sketch has seven black dotted lines, but the notes spoke of five “transects”. The sketch was too small and the whole slide was crowded and overwhelming. 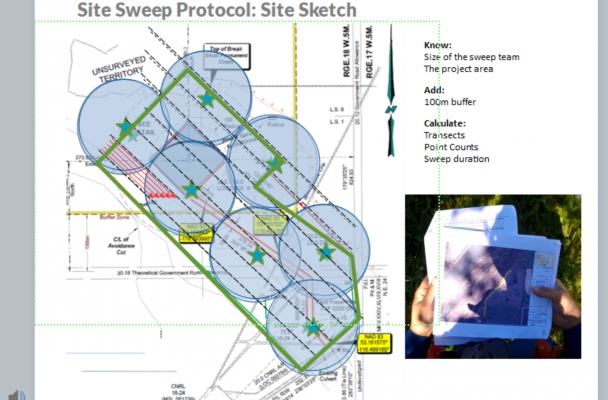 The notes said, “…On our diagram we are assuming 5 people on our sweep team, who will each walk a transect. The division between each set of 5 transects is shown on our diagram with a dotted line.” Five? Where are these five transects? All I could see were the seven dotted lines. 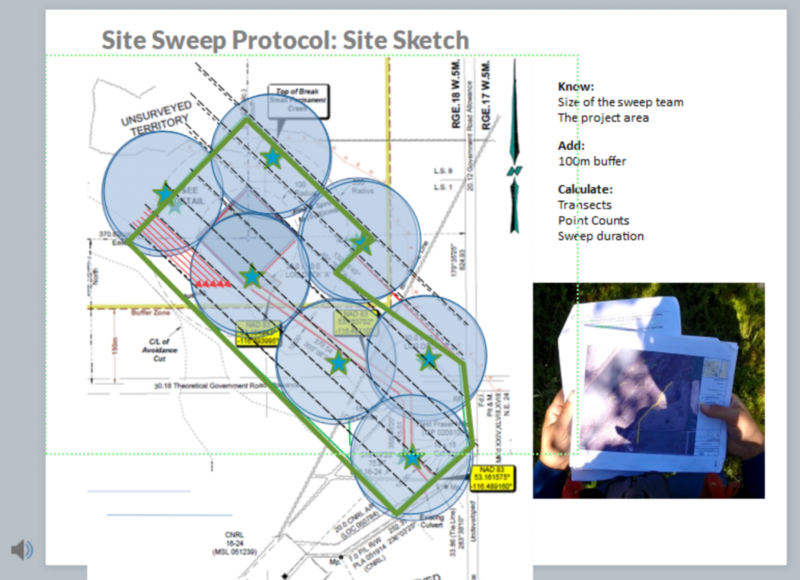 In the middle of this project the environmental consultant was called away to work an oil spill and wasn’t immediately available. When she finished the oil spill, she was exhausted having worked 12- to 16-hour days for almost two weeks. Her employer sent her on vacation — just when I needed her help on our project! The site sketch slide irked me. It didn’t make sense. Was it going to make sense to field workers with more experience? I couldn’t take that chance. I couldn’t just narrate the notes, present the sketch and hope for the best. First, I removed the video placeholder. The video could go on the next slide. Next, I enlarged the site sketch as much as its resolution allowed. And I simplified the sketch by tracing over it. I made the busy diagram fade away. Then each element fades in (or out) with the narration. But the number of lines still didn’t make sense. Before she left for her vacation, my environmental consultant gave me the contact information for a contractor who also worked with the bird nesting sweeps and I called him up. We talked about the sketch for several minutes. I shared the script with him and he finally made it clear that the five transects happen in between the seven dotted lines. That is, the five ’transects’ mentioned in the notes don’t appear in the sketch at all! With this new appreciation for what I was looking at, I understood the notes, rewrote the narration and I made the sketch more clear. I added five red lines. I animated them to flow with the narration and zoomed in so you can see them. This helped to reduce the visual clutter during that part of the narration. My client was pretty happy with the result. The final layout. Click this image to view the final treatment. Click here to see the final animation in action. Sometimes it takes extra attention to detail, a few extra animations, or some well-designed interactivity to make content resonate for online learners. Having good communication with a client is critical to producing a product that works. Adding the extra red lines in this example really made a difference to the effectiveness of the training. Always try to stand in the shoes of the learner and see the content from their perspective, especially when user tests are not feasible. Then do your best to make sure the content is as engaging and as clear as possible.